Home→Our Journey→On the Road→EEK! Battling with the critters! EEK! Battling with the critters! Probably every RV owner has had to deal with damage caused by critters and we are no exception. Rob has been pretty diligent in scattering moth balls around the outside of the motor home and putting dryer sheets, balsam pouches and other “scent confusing” products in all of the basement compartments, but to no avail! Several weeks ago, he went out to the motor home to check things out. When he opened the drawers and cabinets in the kitchen, lo and behold, he found my dish mat and plastic bags totally chewed into pieces, various other things chewed and lots of droppings everywhere. Yuck! After throwing a number of items in the trash, sanitizing all the drawers and vacuuming everywhere, I brought some of my kitchen utensils, cups, etc. into the house so I could run them through the dishwasher. Since they now had invaded our home away from home, more drastic measures had to be implemented. Off to Home Depot we went to purchase a few more mouse traps and to the grocery store for a fresh supply of peanut butter. After setting several traps in the basement area as well as inside the coach, each day Rob would check and would come back into the house almost disappointed that there were no signs of any mice either dead or alive. Hmmm, had we solved the problem so quickly? Not likely! In fact a few new droppings were found. At this point we are figuring the basement must not be on the entry path, so Rob began scouring the rig for other signs. Ah ha! We found a few droppings on top of the generator (in the front of the coach). Sure enough a day or two later, we had our first catch. In the meantime, since the weather was still relatively warm, I started to wax the motor home. After finishing the passenger side, Rob decided to move the coach so I would have room on the other side to work plus I could avoid rubbing up against what we think is poison ivy. Shortly after that, I had let Chooey, our eldest 16 year old, out onto our front porch. Even though he is pretty much an indoor cat, he’s usually pretty good about either staying on the porch or occasionally sitting along the edge of the driveway where I can keep an eye on him from inside the house. Well, I happened to look out and there he was sitting at the bottom of the steps – no big deal, except I could see two little feet and a tail hanging out of his mouth! Oh dear! Poor thing! Even if we tried, there was probably no way that we could rescue the little guy so we decided to let nature run its course. 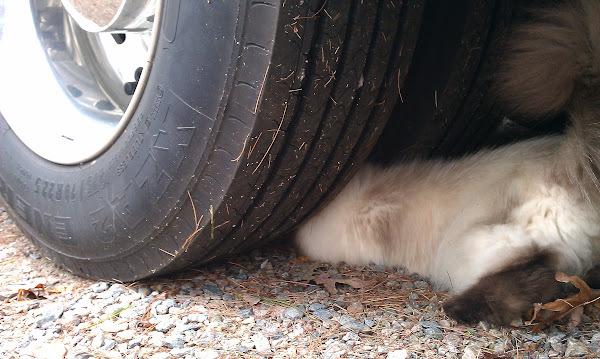 After some time, he finally tired of playing with it but he immediately headed over to the rear wheels on the passenger side of the motor home. Within two minutes, he came out with another one which he immediately started chasing down the driveway. Since the mice were pretty small, we’re thinking that perhaps when Rob moved the motor home, he upset a nest. Chooey headed back there several times but each time he came out empty handed (or should I say pawed). Our mighty hunter finally came back inside looking very proud of himself and promptly fell asleep – he was just so exhausted! The big mystery for us now though was to figure out how they were actually getting inside the motor home. After more investigation Rob found evidence that the point of entry was probably the dash A/C condensate drain which is a 1-1/2″ pipe seen in the photo right. We had a similar problem on our Tundra pickup and if the recirculate baffle is left in the normal position entry can be gained to the inside via the air vents. Closing the recirculate baffle from the dash controls may keep them out – that is until they chew thru the baffle ruining your heating/cooling system! 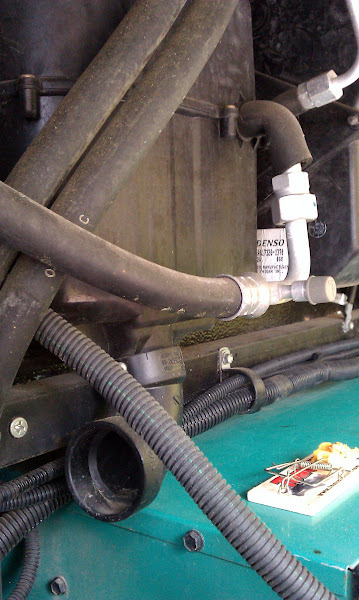 We elected to screen the condensate drain and keep a mouse trap on top of the generator. So another trap was set on top of the generator cover and sure enough the next day we had apprehended a perpetrator. That was on October 9th! And then we caught another one on the 10th. Here we are 4 days later and so far so good and no more perps. Have we won the war – probably not, just a battle or two. Mice are kind of cute and we hate to harm them but unfortunately we really don’t have much choice. Catch and release certainly isn’t an option especially now that the cold weather is moving in, we’re sure that they will want to check into the Discovery hotel for the winter! We’ve also had the “critter” problem on one of our Alpenlite’s. It was in the basement. Good for Chooey. Hope he gets an extra treat. “Catch and Release”, cute comment. Reminds me of Jim’s fishing. I don’t like the release part. We’ve been lucky not to have any infestations like that, but Tim’s Uncle Dean & Aunt Shirley (whom you met in FL) had them this summer and they house their RV in a totally enclosed building!! Hope your problem is solved. 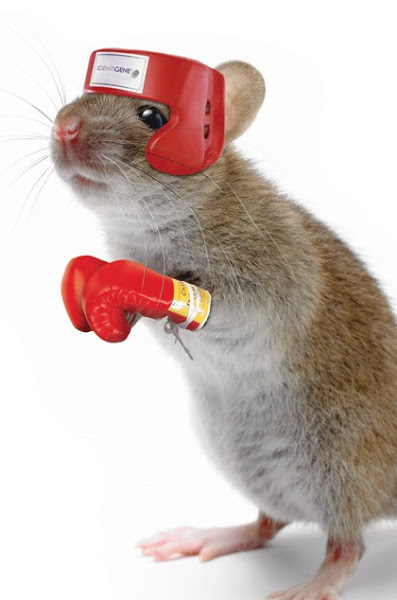 Loved the pic of the mouse fighter!!! !